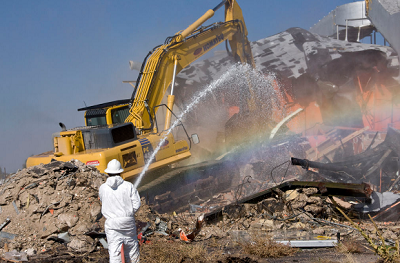 Atlanta Demolition Services always tries and follows every environmental rule they possibly can. Not because we are told so, but because we are sensitive when it come to the future of our planet. We are the greenest demolition contractors in Atlanta, Georgia and always make sure what we are doing, is never leaving behind a bad footprint. We understand that we are only tenants in this world and there will come a time when we will have to pass it on to the other generations. So we do our best to try and preserve a green future. 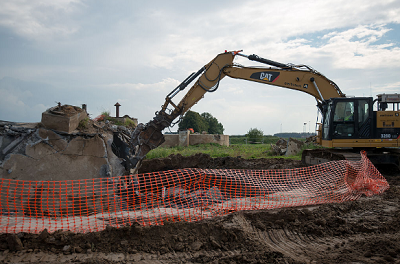 Every piece of concrete, brick, every rock and all pipes are gathered together by our great bulldozers and dumped into the concrete and junk crusher. The end result is much smaller pieces that many times are used for the foundations of other buildings (as those pieces of rock can be formatted in such a way to prove beneficiary for the engineers.) So, none of our materials gets wasted and it will all be used again after the demolition project, one way or another in some other project. It doesn't even need to be our own project. We partner with other construction companies in Atlanta and provide them with these materials. Regardless of your beliefs in the importance of a green and sustainable environment, recycling these materials and picking them off the ground is going to be important for you no matter what. It can be a real ugly site to watch chunks of concrete laying around. We break all these into smaller pieces and take them away for you. Recycling construction materials is not just an obligation for us but it's also our passion. Each and every one of us, has an opportunity to make a difference in their lives and through their line of work. 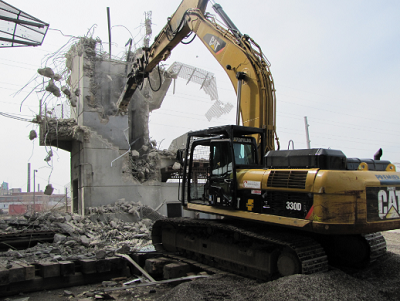 We strive to be the most environmental demolition contractors in Atlanta. Not to brag or tap ourselves on the shoulders, but we believe we have come close to that standard. There is always a lot more you can do to lighten the burden that construction has on the environment. However, we try and tackle this challenge one brick at a time. If you care about the environment (your environment) make sure you contact the greatest demolition professionals in the state of Georgia. Don't settle for anything less. Using a demolition service from someone that follows environmental rules and morals will not make your project more expensive. In fact, we are certain that we have the lowest bid on every single project we do (which is why we outbid everyone.) Give us a few minutes of your time, to learn how we can take care of that construction but also preserve the great planet we live in. Please spend some time looking at the statistics on how much is being spent on concrete and all building materials per year in the US. In terms of money, it goes way up into multiple billions of dollars. Regarding pollution and the environmental burden you can imagine what is happening there. So the least we can do, is just re-use some materials even if it's for something as simple as building the foundations. If every demolition company in America did this, we would be so much better and I am sure our good planet would appreciate that too! 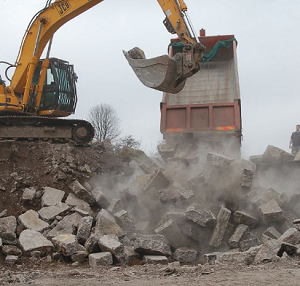 There is no need in thinking that all demolition companies are the same, just interested to turn a profit regardless of the environmental effects. We actually really care about it all, because we want our children to be able to enjoy something at least a little bit better than what we enjoyed. I understand that most demolition companies in Atlanta, Georgia aren't going to be cautious about these sensitive and highly important issues. But rest assured, that we don't fall under the irresponsible demolition contractor category. We are striving to be the company that really makes a difference and doesn't put more weight on the already heavy and serious problems our environment is facing due to human activity. We don't need legislators and law makers to keep chasing after us in order to be responsible towards our environment and all the people and living beings in it. Demolition companies in Atlanta need to have the sensitivity to look after future generations. It really is essential that we stay true to ourselves and that we don't sell out. Although we can't guarantee you that other companies will be "green" in their demolitions, one thing we can promise you is this: we will never ever do something that will be a burden to the environment, willingly. As much as possible and in every project, we will try to clean up our act, recycle materials and cut down on the waste. Thank you for putting your trust in the most environment friendly demolition company in Atlanta!